Block 197 Belgian Trappist beers. Block 198 EUROPA -Visit Belgium. Block 199 Cartography - Anniversary Gérard Mercator - Jodocus Hondius. Block 200 Aländ-Belgium Joint Issue: 100year Anniversary of the 'Downfall of the Titanic' in 3D. Block 201 This is Belgium : Humour. Block 202 Belgian regions : the Condroz region. Block 203 Promotion of philately : Big place of Brugge. Booklet 125 Mythical creatures - self adhesive. Booklet 126 Write each other. Booklet 127 Franco Dragone - self adhesive. Booklet 128 Pets - self adhesive. Booklet 129 Pierre Alechinsky - self adhesive. Booklet 130-131Definitive Issue 'Butterflys' - self adhesive. Booklet 132 Three Leafs - self adhesive. Booklet 133-134 Christmas & New year - self adhesive. 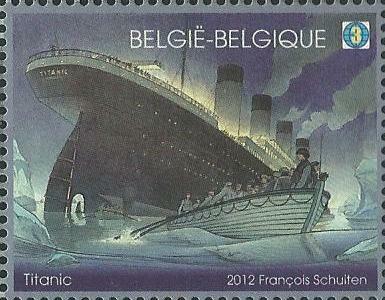 4228Hk Aländ-Belgium Joint Issue: 100year Anniversary of the 'Downfall of the Titanic' in 3D. 4254HK Monaco-Belgium Joint Issue: Stamp Collection : Prins Albert II of Monaco.